Spring has burst onto the shelf behind the kitchen sink. The single ivy ball topiary is no longer alone. have joined the ball topiary. 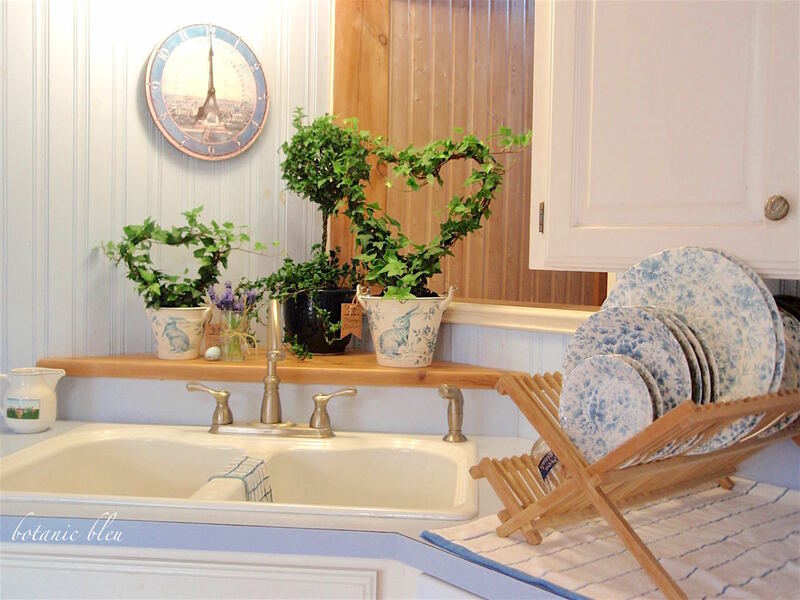 Washing dishes is much more pleasant now with heart topiaries in blue bunny pots overlooking. 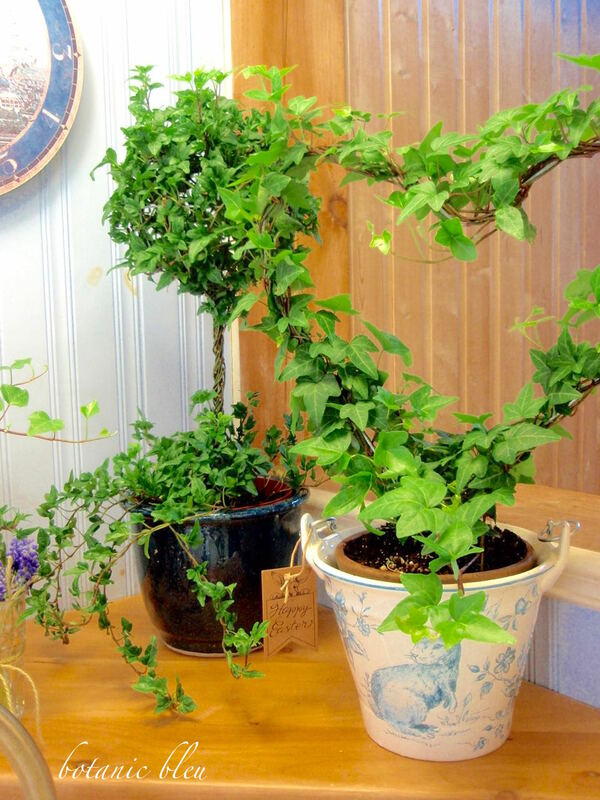 A few readers have asked for tips about how to care for ivy. overwatering, underwatering, and plain old fashioned neglect. Here's what I've learned from all those years of trying one more time. keeping the plant watered regularly, but not overwatering it. Check the soil regularly. As long as it feels moist, do not add water. Water only when the soil feels dry to the touch of your fingers. Yellow leaves are signs of possible overwatering. anywhere from once a week to once a month. the more frequently the plant should be washed. to swish the plant in a soapy cool bath. For larger plants, spray with soapy water using a spray bottle. Remember to spray the underside of the leaves also. Tip number three... Hot, dry air is an ivy's enemy that invites pests. Between soapy water baths, mist/spray the plant with cool water. 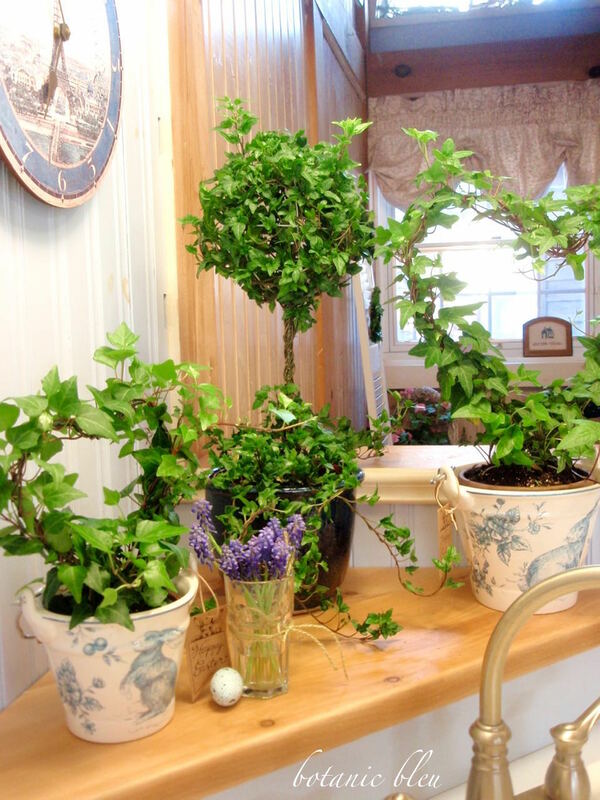 it is easy to place the ivies in the sink and to spray them with the sink's sprayer. An alternative once again is to use a sprayer bottle. A fourth tip is to remove dead or dying yellow leaves as soon you spot them. Keep the pot free of dead leaves and debris. Isolate any diseased plants from healthy ones to prevent spreading diseases. A fifth tip is that ivy likes bright light, but not direct harsh sunlight. Think about where you see ivy growing outside...under trees and on trees. but in warmer climates like Texas, the hot relentless summer sun will fry ivy. and cloudy skies that provide relief from harsh sunrays. 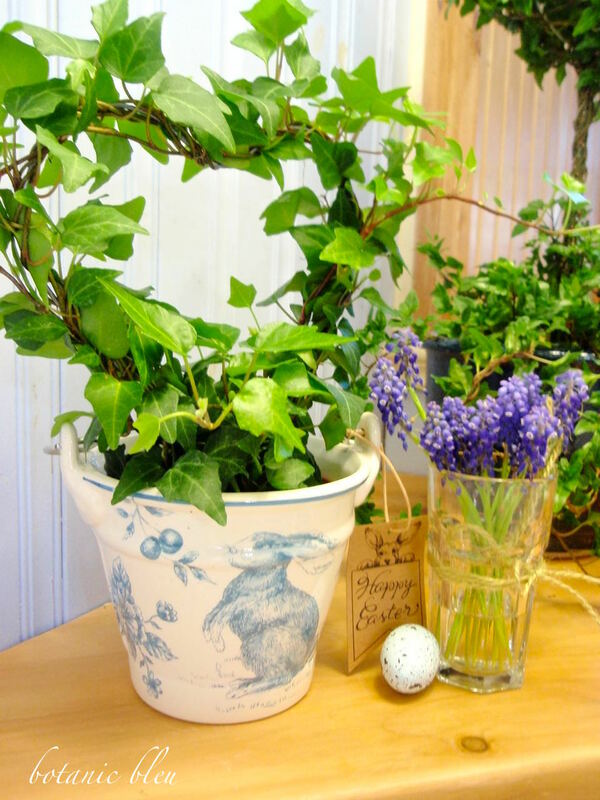 Tip number six is to give the ivy a beautiful pot in which to live. All of these ivy plants are in either a plastic or clay pot that fits inside the pretty pots. A pot with a drainage hole keeps the plant from standing in water. I love ivy. I used to have fake ivy topiaries, but no longer. I may have to get a real one and try it. Those bunny pots are really cute! I can see I need to stop by Home Goods. '-) What a cute container! I have mixed luck with topiaries. I'm trying a table of them outdoors this spring. Will see how that goes. That pot is so you and so perfect for your topiaries. Topiaries always shout at me across the store and say, "Buy me!" I'm a killer though. If I see one soon though, I will probably try your tips. Too hard to resist. I sure wish you had a Pin It button on your photos so I could pin your pretty pictures! Love! I'll be hitting Home Goods more often. 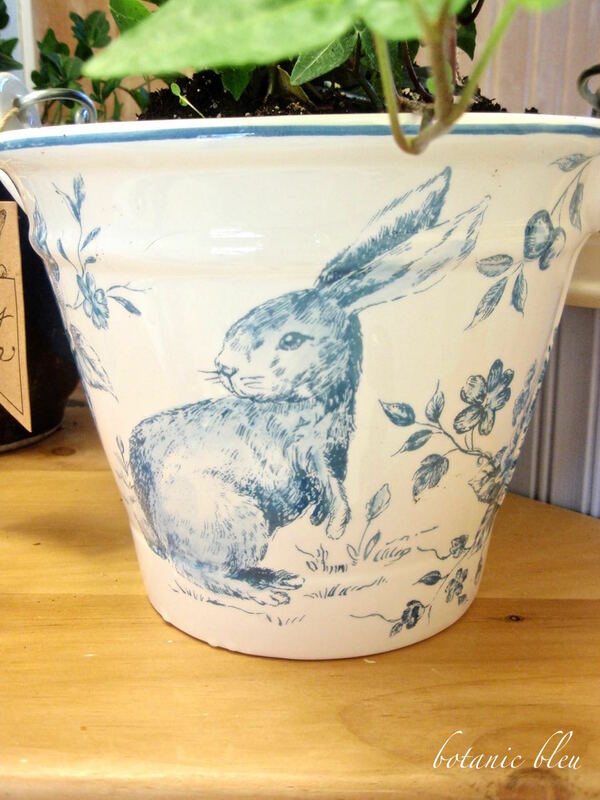 There is always something there I love and I sure love the bunny pot! Everything looks beautiful! I would not have been able to leave that bunny pot behind. It is lovely and there is no question that any ivy would thrive in such a pretty home. I really, really love that blue bunny! I think white is for all seasons, don't ya think? Enjoy a wonderful day dearest Judith! It's about that time of year Judith where your gardens and garden house come to life. The Bleu bunny pot welcomes springs birth and Easter in your signature patina of blue. I am working on pillow shams with natural hemps with an added French Bleu stripe added to them, I may have to keep one for myself....Bleu never goes out of trending, it being an earth element. And we are seeing so much more use of it in blog land these days...miss mustard seed being one of them. Looking forward to your spring gardens and garden house. My friend Alice gifted me a bunny pot from Home Goods for my birthday. It's egg shaped with a little brown bunny on green grass with French writing. It has the same little tag as yours that says Happy Easter. You have inspired me to gather blue for our bedroom and master bath. 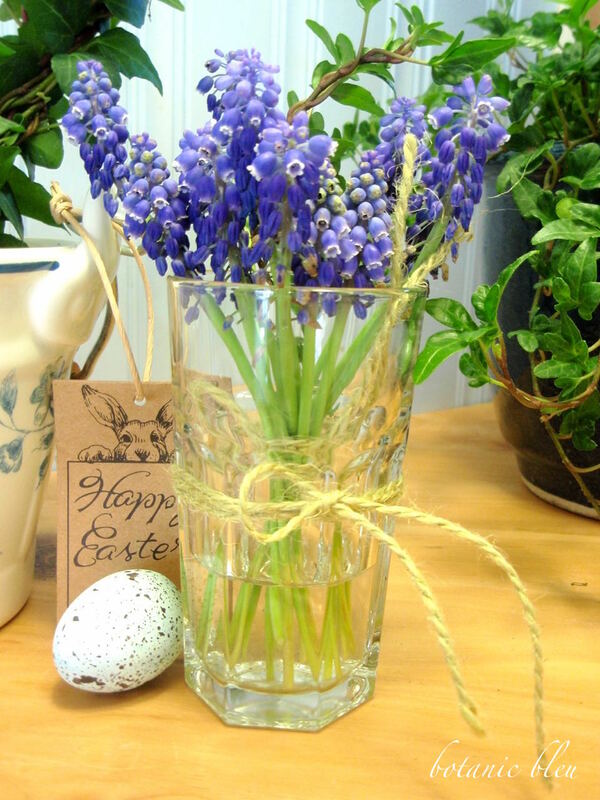 Wishing you Easter blessings, Judith! 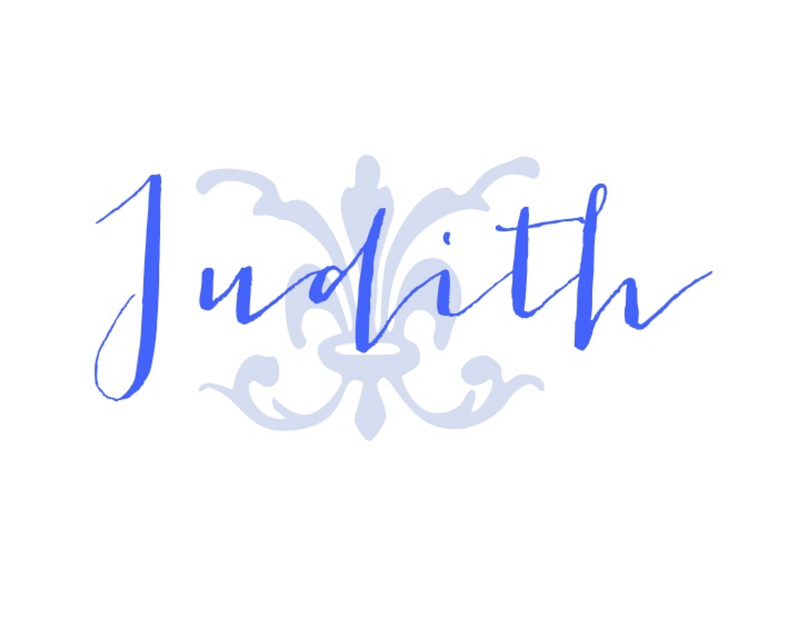 Judith- I know exactly how you feel about wanting white- but leaning toward blue and white. 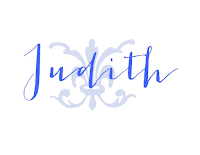 Hi Judith.... Just found your beautiful blog through Jemma. I LOVE those flower pots! 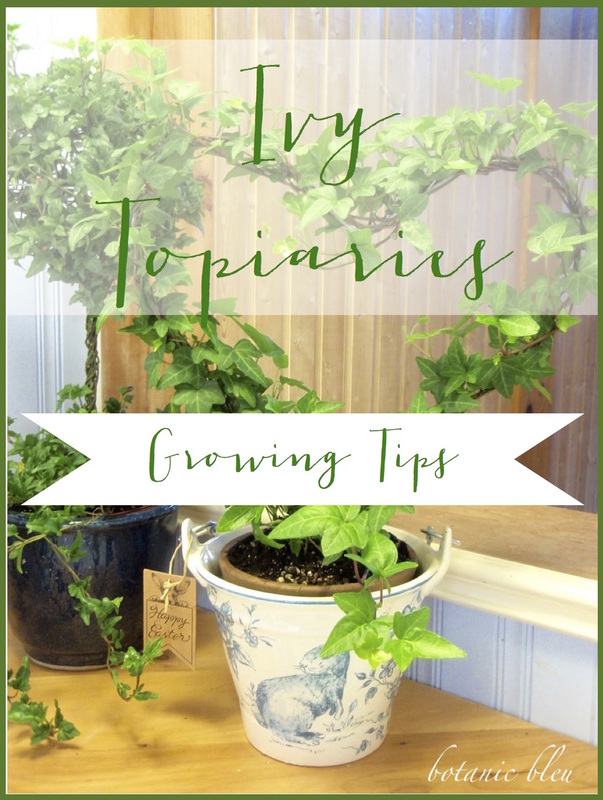 I also appreciate the tips on the ivy as I have 3 topiarys in my house. Hope you have a great week!! A lovely post. Thanks for the helpful tips. Thank you, Kathryn, for hosting the Anything Blue Friday linking party where we can find so many links to the beautiful blue we love. 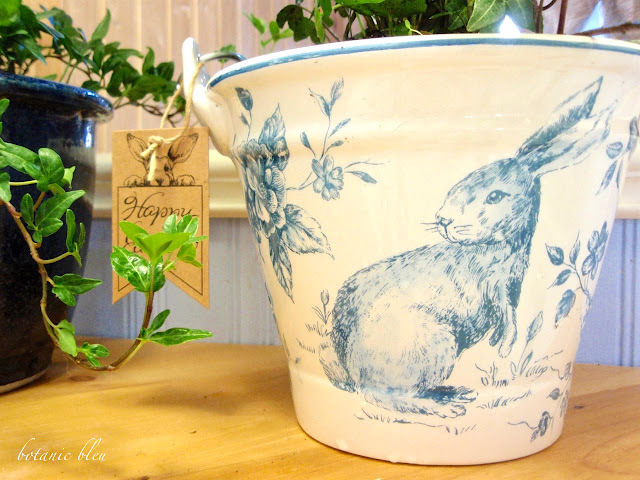 I am honored that you featured these adorable bleu bunny pots.